In was the fall of 1994, and I was but a lowly intern at Salem, MA-based record label Rykodisc. Specifically, I was the “online” intern, primarily responsible for maintaining the label’s forum on the Delphi ISP1. Commercial online services like Delphi were essentially separate from the then-nascent web, and only the largest services had fancy, proprietary graphical interfaces. So Delphi’s forums were text-only, though ours had downloadable cover art, plus a few rudimentary sound clips. And since I had interned for Delphi that summer, I was already pretty comfortable with my forum management duties and was looking for a new challenge. So while my boss Lars frantically tried to get us a spot on the then hip-and-happening online place2, I decided to attempt creating a page on this new thing called “The World Wide Web.” A Delphi co-worker3 had shown me a bit of the web a few months earlier, and I, like many others who stopped by his computer to take a peek, were immediately seduced. It wasn’t just that there were pictures, though that was indisputably cool. It was the whole, hyperlinked way of interacting with information, the self-published free-flowing-ness of it, which left the green-text-on-a-black-screen, press-a-number-to-select, BBS-style interface and walled-garden paradigm we were used to in the dust. Armed with a SLIP connection4 to a local ISP and a 14.4k Modem, I fumbled my way around creating my first page, starting by viewing the source HTML code behind the web pages I visited, and pasting the contents into my text editor to mess around with and preview in my Mosaic browser.5 Then I bought a book, one of the first on HTML6, which helped me build upon the fragments of knowledge I’d picked up by trial-and-error. And since creating a web page was free7, my boss was all for it, even if, as I warned, I wasn’t sure how many people would be able to view this page. It might only be visited by students and academics, the only large demographic groups likely to have Internet access. The vast majority of the online population then, including anyone using the major ISPs — AOL, Prodigy, CompuServe — still did not have access to the web. 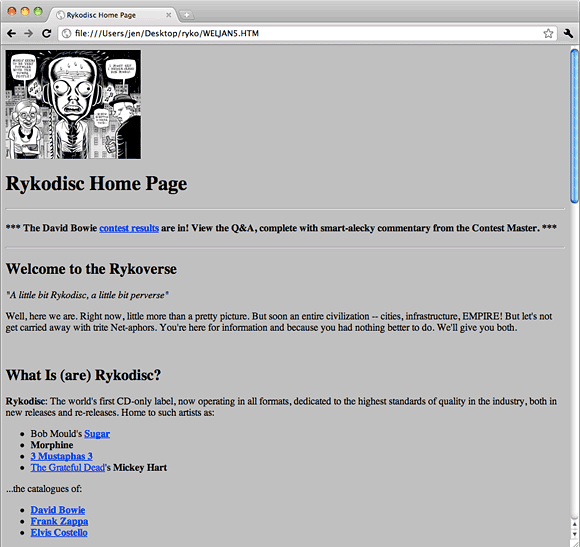 What I did have: a collection of links to web pages for Rykodisc artists I’d gathered via web searches, digital album artwork scavenged from the art department’s file server (including that nifty Dan Clowes piece from a Ryko sampler CD), and witty, brand-appropriate copy written by Lars. That’s right, early web pages were all about the content, if only because there was precious little design one could apply. It may not be a pretty web page, but it served its purpose and started me off on a path I continue to this day. Figuring out how to build something from nothing, even when I hadn’t a clue… that was heady stuff. And it’s one of the reasons why I continue to preach the power of prototyping to other UX and design folk. That is to say: I did it, and so can you. 1. Delphi’s two main claims to fame in the footnotes of Internet history: a) Edging onto the list of Top 5 nationwide Internet Service Providers, and b) Getting purchased around that same time by Newscorp, in one of their first in a string of ill-fated online forays. 3. Renowned writer Jimmy Guterman, who I also recall assisting in what would now be called his “liveblogging” of the Rolling Stones’ “Voodoo Lounge” tour kickoff for Delphi. 4. Serial Line Internet Protocal. Pre-PPP, yo! 5. This was just before the first Netscape beta was released. 7. Even — believe it or not — the domain registration at that time. Also free.